Article Highlight: Does Cranberry Juice Have Vitamin C? Eat a variety of food to ensure adequate vitamin intake. You can get all you the nutrition you need from vitamins in food. From juicy oranges packed with vitamin C to salads rich in vitamin K, vitamins found in food are often easier for the body to digest and assimilate. Many vitamins need fat and/or other vitamins or minerals to be readily absorbed and used. Nature often provides the necessary elements in the perfect combinations and proportions. 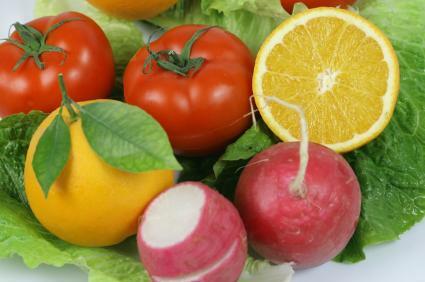 To get all the vitamins you need to meet the RDA, simply eat an abundance of fresh fruits and vegetables. Most Americans who consume the standard American diet eat far too little of these nutrition powerhouses. Adding them to your diet is not as complicated as it may seem. Start by adding a green salad to your dinner, or switch one snack from processed foods to delicious fruit. Eating according to color is another method to ensure you get vitamins in food in your diet. Start with the purple end of the spectrum and try a ripe plum or a serving of beets. Move on up to the red, orange, yellow, blue and green colors of the rainbow and you're sure to eat a wide variety of fruits and vegetables. That's the key to getting plenty of vitamins in food, along with minerals, enzymes, and antioxidants. No matter your taste, if you eat a wide variety of food every day and eat from the full spectrum of the rainbow, you're sure to get plenty of vitamins in food. Adding fruits and vegetables and the essential vitamins, minerals, and fiber they offer can help protect from chronic diseases.